This week Steven Universe has returned with what is rapidly becoming one of its most compelling storylines so far, as the Crystal Gems come to terms with the shocking revelations surrounding Rose. Last night’s “The Question” not only gave us one of the show’s sweetest episodes, but also a major milestone in the series’ championing of representation. This week’s series of episodes have seen Garnet, so emotionally compromised by the revelation that Rose Quartz was secretly Pink Diamond all along, split into her two component gems, Sapphire and Ruby. Earlier episodes in the week dealt with Sapphire’s reaction to not having been able to see Rose’s lies for what they were, but “The Question” turned its attention to Ruby, who has a slightly different approach to the shock of being torn apart from the love of her life. After hanging out with Greg and eating copious amounts of pizza, Ruby doesn’t just learn to get over Rose’s revelation alarmingly quickly—she realizes that she’s enjoying being free to process it alone, without Sapphire, as an independent Gem. Which, of course, leads to her wanting to be a cowboy for a bit, because nothing says independence like country songs and Amethyst shapeshifting into a trusty steed. Ruby proposes to Sapphire. Gem wedding incoming! It’s not just a beautiful moment for the characters (the strains of “Stronger Than You” swelling in the background!) but it’s a landmark moment for a kid’s show. You can get into the quibbles of the fact that they’re technically genderless rocks from outer space, but here are two female-identifying figures—two main characters of the show’s cast—getting engaged, wanting to have their love symbolized even beyond the time they’re fused together as Garnet. Steven Universe has never been particularly shy in hiding its queer relationships (although certain Cartoon Network censors have tried to), especially when it’s come to Garnet. And Ruby and Sapphire’s marriage-to-come is just the latest stepping stone that’s seen LGBTQ relationships find their way into kid-focused animation, from Legend of Korra’s fleeting final confirmation of Asami and Korra’s relationship (which unfortunately had to be left until after the show ended to be explicitly acknowledged) to series like Clarence and The Loud House giving us married LGBTQ couples in supporting roles. 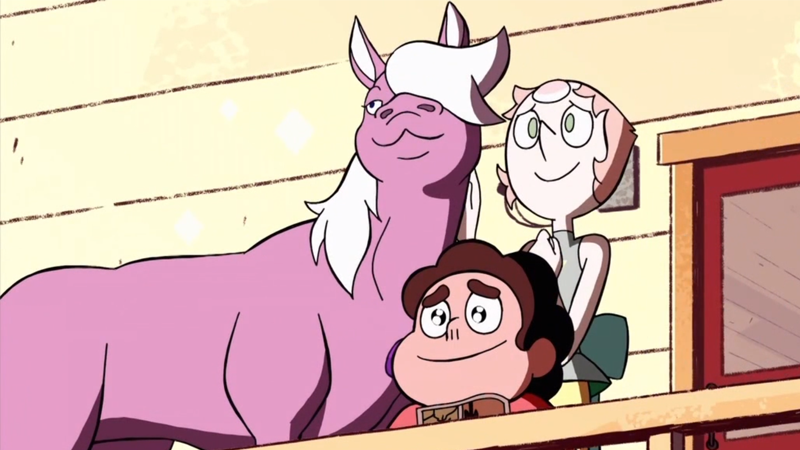 But it’s important that Steven Universe has built this major arc around the relationship between Ruby and Sapphire’s love for each other, and is culminating it with two of the most important characters in the series getting to have that love be represented explicitly through their marriage. Garnet has always been vital to the show, but now Ruby and Sapphire as individuals are as well. Let’s just hope it goes more smoothly than the other big pop culture nuptials of the week, eh?